Speedmonkey: Which new car would you like to see given the 106 Rallye treatment? Which new car would you like to see given the 106 Rallye treatment? 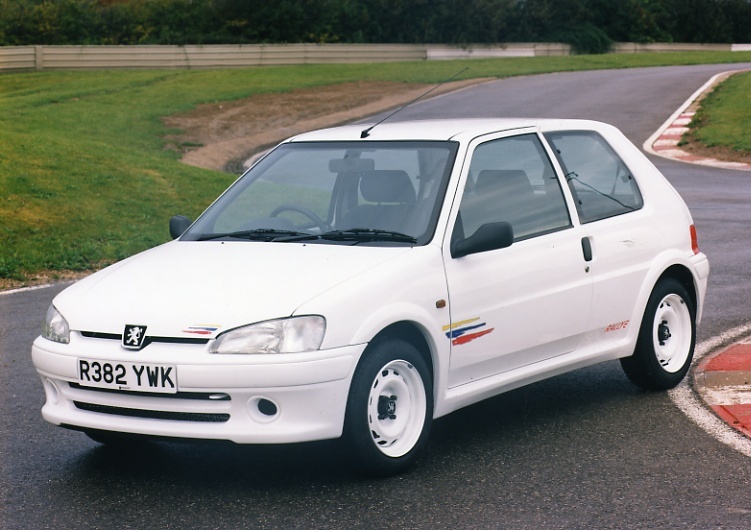 The Peugeot 106 Rallye S2 was essentially a stripped out 106 GTi. The Rallye shared the GTi's chassis and engine but lost non-essential items such as electric windows, sound insulation, power steering, ABS and alloy wheels. The name was cunning. It wasn't a rally car per se but the Rallye name hinted that it would be capable of sideways action on a stretch of gravel. Its bodykit and paint schemes didn't hurt that association. As such the 106 Rallye was a proper, lightweight hot hatch with dynamic handling and massive chuckability. Rather than spout on any more I'll let Vicki Butler-Henderson tell you why it was ace. The 106 Rallye showed us that to make a normal car fun you must add lightness (© Colin Chapman). It weighed 868kg, did 39mpg and spewed out 174 g/km of CO2. And that was in the late 90s. Yet today's hot hatchbacks, and most cars come to that, are heavy old things. The new Golf GTI weighs 1,325kg, the Peugeot 208 GTI weighs 1,160 and the Renaultsport Clio 200 Turbo weighs 1,204kg. Even the Fiesta ST weighs 1,100kg. Remember, the Peugeot 106 Rallye weighed 868kg. That's a full 292kg lighter than the 208 GTI. An adult male Grizzly bear weighs 290kg. The 208 GTI is the 106 Rallye with a Grizzly bear in the passenger seat. I know safety and environmental legislation adds weight to a car but 300kg? Come on! My top choice for a modern Rallye would be the Renaultsport Megane 265 Cup. I'd ditch the back seats, all the piano black, stereo and half the door trim. The electric windows would stay because modern electric motors are pretty light, and integral to the design. Engineering manual windows in would be a nightmare. I'd replace all the plastics with something super light like, ooh, I don't know - bamboo? That's pretty light and strong. I'd probably be happy with some plastic non-stressed body panels too. I'd lose the aircon and all the enviro-gubbins such as engine gas recycling that keeps the CO2 figure down and puts the weight up. The Dynamic mode, adaptive dampers and all that crap would go. It wouldn't need adaptive suspension because it would be light enough not to need different modes. The standard Megane 265 weighs 1,379kg. I reckon my Renaultsport Megane 265 Cup Rallye could get it down to 1,000kg easily. So my question is, what modern car would you like to see a Rallye version of? And what parts and components would you lose to make it a Rallye?